Sweet, tannic, dry, lively. Wine possesses very subtle flavors and characteristics. But this is not happenstance. Producing wine is a complex undertaking. The fermentation process in particular plays a key role in how different flavors develop. Daniel Attinger is a professor at Iowa State University (USA) who has been invited to visit EPFL's Microsystems Laboratory. He is the inventor of a "micro winery” on a chip, to help wine experts better understand and improve the fermentation process. 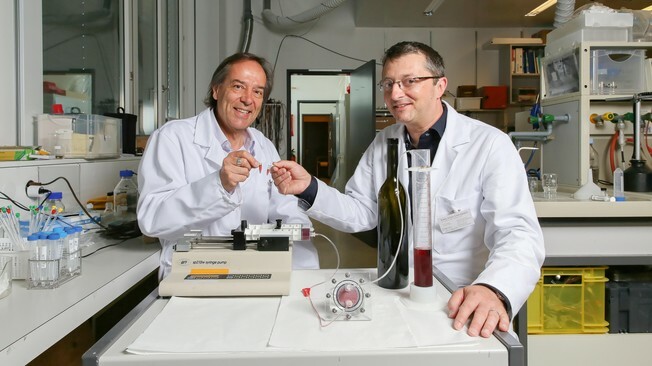 The device, which an EPFL team will also work on, is capable of producing wine non-stop at the rate of one milliliter per hour. It will be used for testing fermentation processes. This innovative approach has already attracted the attention of schools like the Changins School in Switzerland, one of the top winemaking schools worldwide. The idea originated with Attinger, a former EPFL student from the Canton of Valais who is also a wine connoisseur. “Climate change is having an impact on the quality of grape crops around the world,” he said. “Due to the heat, some crops ripen too quickly, the harvest takes place sooner and the wines end up with a higher alcohol content or a different taste. We need to find ways to analyze and adapt how the wine is made.” Drawing on his expertise in multiphase microfluidics, Attinger came up with the idea of a micro-channel device that could quickly identify the best temperatures and yeasts for the fermentation process. Winemakers traditionally add yeast to barrels full of grape juice. The yeast absorbs sugar and releases alcohol and carbon dioxide. This process, referred to as alcoholic fermentation, takes between 7 and 21 days and requires a large volume of liquid. Hundreds of types of yeast, each one associated with different flavors, are commercially available. Selecting the best ones is a time-consuming process. Attinger’s micro winery is designed to help wine experts and winemakers test different fermentation processes. It uses very small quantities of liquid and produces a result in less than an hour. “Let’s say a winemaker in the Lavaux region of Switzerland finds that a certain type of yeast or a certain fermentation temperature leads to an overly bitter wine,” said Attinger. “We could quickly test alternatives.” Because his device is so small, the temperature can be increased or decreased very quickly. The device has a main channel through which the grape juice winds its way. The yeast is placed in adjacent compartments and feeds into the main channel through a very thin membrane with holes called nanopores. It’s almost as if they were in little tea bags. When the grape juice reaches the yeasts, they absorb the sugar and give off alcohol and CO2 through the membrane. This process takes place very quickly, since the sugar and yeast are confined in such a small space. The use of compartments means that the fermentation process can be repeated very easily. “At a traditional winery, it takes weeks to separate the yeast from the wine, because they’re mixed together. That’s not a problem here,” said Attinger. The role of the EPFL researchers is to monitor the behavior of the yeast in the bioreactors. “We ‘screen’ the yeast, which consists of analyzing what the yeast produces as a function of the conditions that we determine,” said Philippe Renaud, the head of EPFL’s Microsystems Laboratory. Daniel Attinger’s team in the United States includes a professor in electrical engineering, an enologist, and a PhD student who specializes in microfabrication.